For the ancient division of Lancashire, see West Derby (hundred). Not to be confused with Western Derby. West Derby (/ˈdɑːrbi/ ( listen) DAR-bee) is an affluent suburb in the east of Liverpool, Merseyside, England. 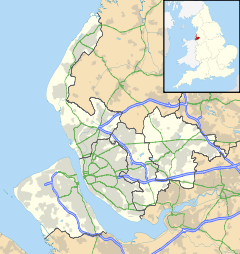 Historically in Lancashire, it is also a Liverpool City Council ward. At the 2011 Census, the population was 14,382. Mentioned in the Domesday Book, West Derby achieved significance far earlier than Liverpool itself. The name West Derby comes from an Old Norse word meaning "place of the wild beasts" or "wild deer park" and refers to the deer park (now Croxteth Park) established there by King Edward the Confessor. West Derby became the main administrative area in today's Liverpool for the Norman Conquests and was the largest area within the West Derby Hundred which covered most of south west Lancashire. West Derby once had a Motte and Bailey castle, now completely disappeared. There is also some suggestion of a Roman site on a street called Castlesite (nicknamed "The Rosies" by some locals). The site is now a small public park, the shape and dimensions of which are similar to that of a Roman barracks or castra. The remnants of a wooden castle were unearthed on this plot during excavations in the mid 1930s. The Earls of Derby were conferred their title from West Derbyshire, and not as commonly thought Derbyshire and ultimately where the word Derby (horse race) is derived from. There still remains a courthouse built in the reign of Queen Elizabeth I: the first (Wapentake) court in West Derby was established around 1,000 years ago. The West Derby Courthouse, built in 1586, was restored and conserved in 2005 and is the only freestanding post-medieval courthouse in Britain. The tiny Grade II* listed building is open to the public between 2 pm and 4 pm every Sunday except Easter from April to October inclusive, admission free. Opposite the courthouse is a set of Victorian cast iron stocks once used as a public restraint for offenders. Villagers used fruit and rotten vegetables to throw at the offenders. The stocks were placed in their current position to commemorate the coronation of Edward VII in 1902. Temporarily removed in 2008 whilst the site was renovated, the stocks have since been put back in place. The area was home to the Earls of Sefton (family name Molyneux), whose house, Croxteth Hall, and the surrounding countryside estate now forms Croxteth Park, an attractive public space. The three elected councillors for West Derby ward are Cllrs Pam Thomas, Daniel Barrington and Lana Orr of the Labour Party. The area is part of the Liverpool West Derby Parliamentary constituency currently represented by Stephen Twigg. Alder Hey Children's Hospital is located on the south side of West Derby, at Eaton Road. Both Everton, and Liverpool football clubs located their training grounds in West Derby, Everton at Bellefield and Liverpool at Melwood. However, in 2007 Everton moved to their new complex in south Liverpool called Finch Farm. The West Derby Society was founded in 1977 and holds regular monthly meetings and outings. It also lobbies on planning and environmental issues. The West Derby Community Association, a registered charity, owns Grade II-listed 'Lowlands' in West Derby. This 1846 mansion underwent restoration and renovation with the help of a £1 million Heritage Lottery Fund grant. West Derby is home to a number of schools that have produced famous pupils: West Derby School, one of whose alumni is actor Craig Charles. St. Edward's College produced Sir Terry Leahy, former England rugby union player Mike Slemen and actor Michael Williams. Cardinal Heenan Catholic High School includes Liverpool footballer Steven Gerrard, professional boxer David Price and musician Mike di Scala. Previously called Cardinal Allen Grammar School, it was attended by Everton footballer Colin Harvey, United States Eagles rugby player,Michael Caulder, who played in the first Rugby World Cup in 1987, and actor Paul McGann. Broughton Hall High School former pupils include singer Natasha Hamilton of Atomic Kitten, and actress Jennifer Ellison. Ellison later moved to St. Edward's College for sixth form. Other schools in the area include Holly Lodge Girls' College, St. Marys Primary School, St. Paul's Junior School, Blackmoor Park Junior School and Emmaus Primary School. Well known residents of West Derby have been; William Lassell (he built an observatory at his house "Starfield" in West Derby, a suburb of Liverpool. There he had a 24-inch (610 mm) reflector telescope, for which he pioneered the use of an equatorial mount for easy tracking of objects as the Earth rotates), Shakespearian actor Leslie Banks, the Beatles' first drummer Pete Best, who lived in Haymans Green - the home of the Casbah Club where the group first practised; Herbert Haresnape, Olympic swimmer 1908, 1912, Bill Shankly the iconic Liverpool F.C. football manager, whose house overlooked Bellefield; Carla Lane the scriptwriter lived close by, as did Eddie Braben, the scriptwriter for Morecambe and Wise, Bessie Braddock the famous Liverpool Exchange Division MP and Olympic bronze medal boxer, David Price. Albert Menotti Haynes was born and lived in West Derby, he worked as a railway clerk before emigrating to Argentina and founded the Editorial Haynes publishing empire, he and his wife were also involved in founding Northlands School. Trent Alexander-Arnold, a youngster of local club Liverpool F.C., was born in West Derby near the Melwood Training Centre. West Derby railway station was located on the North Liverpool Extension Line. The station building has since become a shop and the access ramps to the former platforms remain, although one of the passages have been closed off to the public. The track has been lifted and the trackbed now forms part of National Cycle Network Route 62 and a public footpath between Liverpool and Southport. Brookside Close in West Derby. ^ "City of Liverpool Ward population 2011". Retrieved 12 January 2016. ^ "History Of Liverpool - West Derby Castle Page". History Of Liverpool. Wikimedia Commons has media related to West Derby.